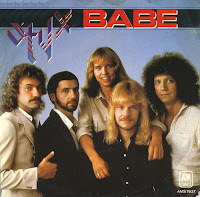 Syrupy sweet and slightly silly, the ballad 'Babe' was a big hit at the end of the Seventies for the American band Styx. Written by band member Dennis DeYoung as a birthday present for his wife Suzanne, it was not originally intended to be a Styx track, but the band decided to include it on their album 'Cornerstone' upon hearing the demo by DeYoung and Styx membes John and Chuck Panozzo. The song became Styx's first and last US number-one single, also reaching number 6 in the UK singles chart and number 9 in the Dutch Top 40.